I've been here in the Escapees park (Pair-a-dice) on the outskirts of Pahrump, Nevada (about 50 miles northwest of Las Vegas) for the last 10 days. As soon as I arrived, temperatures dropped and it has been very cool - and downright cold at night. I spent most of my time here doing maintenance and improvement jobs on the truck and trailer. Among the jobs completed were washing and waxing the truck and adding a transmission temperature gauge. In the trailer I raised the bathroom cabinet so that I can now see my face above my chin in the mirror, and I built and installed a "toilet wand" for rinsing out my black water tank. It turns out that Pahrump valley is bordered on the east by the Spring Mountains, the highpoint of which is Charleston Peak, the 3rd highest peak in NV at 11,918 feet. Although the mountain is only about 20 miles from Pahrump, the usual approach is from the east, about 100 road miles away. I decided to give it a try from the Pahrump side. Thursday I found 2 possible approaches via dirt roads, but on the first I ran into private property with "No Trespassing" signs, and on the 2nd I reached a point about 10 miles from the mountain where the road was not good enough to risk driving the truck any further. Friday morning I returned to the end of the driveable road, and had a great hike to within about 2 miles and 4,000 vertical feet of the peak. 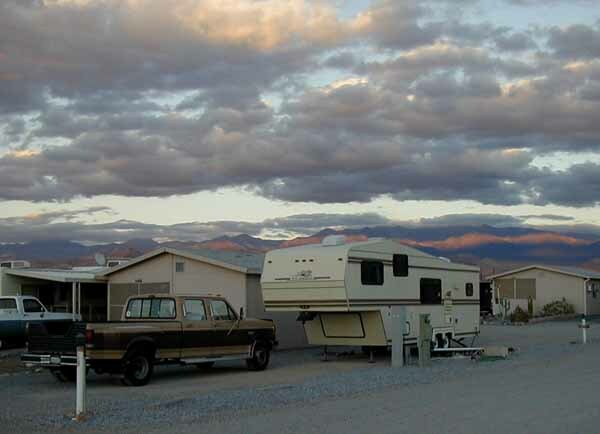 Maybe I'll get back to Pahrump again some time, and now I know there is a great climb waiting for me. And now I need to wash the truck - again! 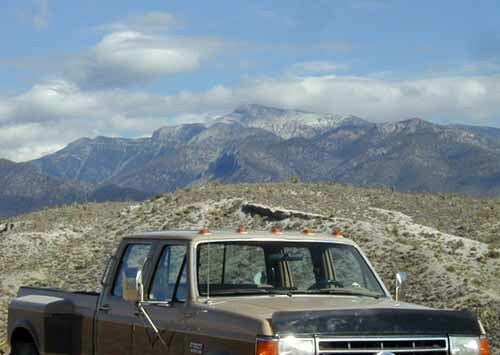 Not far from Pahrump is a ridge called Yucca Mountain, located on the boundary between the Nevada atomic test site, Nellis Air Force Range, and Bureau of Land Management land. Congress has recently approved the building of a "geologic repository" for nuclear waste under Yucca Mountain. I took a Department of Energy tour to the proposed repository where I was able to walk into the 25 foot diameter exploratory tunnel, view the giant rock cutting machine that carved the tunnel, and to ride to the top of the ridge for a view of the surrounding landscape. The Yucca Mountain project is a massive and a very interesting undertaking. The goal is to completely contain radioactive waste for at least 10,000 years. If things go according to plan, they will begin collecting nuclear waste from 131 temporary storage sites in 39 states, and storing it under Yucca Mountain, in 2010. Tomorrow, Sunday, I plan to hitch up the trailer and head for Death Valley. This is a change in plan, but what the heck; I'm only about 40 miles from Death Valley, I've wanted to explore it for some time, and this is the right time of year to do it. So I'll head northwest rather than southeast, and probably spend about 8 days in the Valley before heading south, and then resuming my eastward journey . Some Nevada culture. 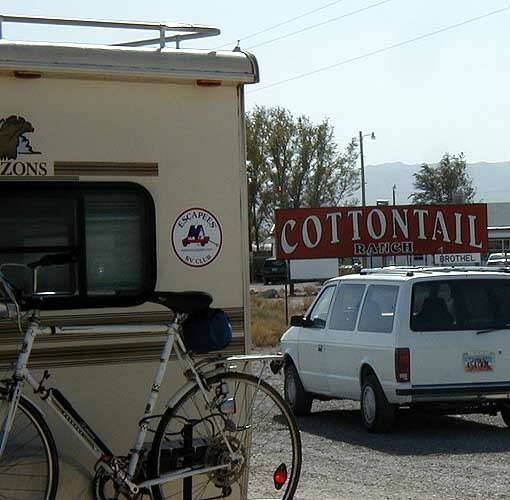 The Cottontail Brothel is conveniently located at the intersection of NV 266 and US 95 near Lida, NV. Charleston Peak as seen from the starting point of my hike. Last light hitting the Spring Mountains.